What is information processing cycle? 4 phases of information processing cycle? The task of computer, in low level, is to process given data to produce information. Computer takes data, then processes the data as per being instructed and then can either output the generated information to user or store the information to storage or can do both. The generated information can be treated as data in the next cycle. 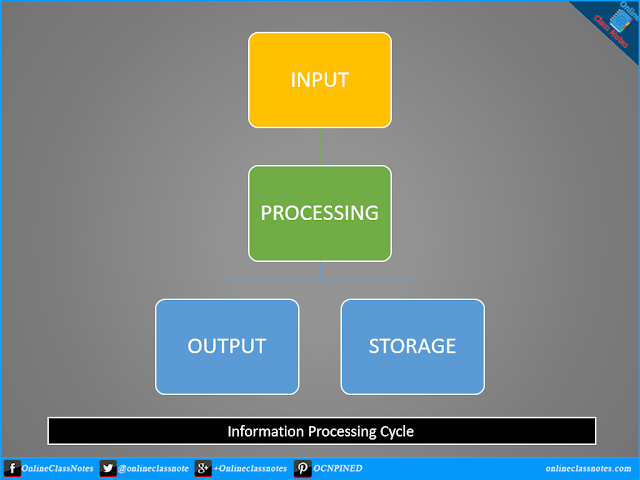 These operations are part of a process called Information Processing Cycle which is a set of steps that computer follow to receive data, process the data and then either display the output to user or store the output to storage or do both. In this phase the computer receives data from input source by user or a program. An input source by user can be an input device like keyboard, mouse, microphone etc. After receiving data, here the computer performs actions on the data like mathematical operations or logical comparisons etc. as per being instructed by user or a program. After processing the data computer has generated information that now can be sent to output. Output can be sent for display in monitor, or to printer or speaker as sound etc. It is also as per required by the user or program. Again, after processing the data, computer can also store the data into an storage device for future use. Phase output and storage, are optional. Both of them can be required and vice-versa, as the generated information can also be directly used by another processing cycle where this generated information will be treated as data to be processed.